A cylinder blast at Bagalur in Bengaluru during the shooting of a film cost the life of a mother and daughter who were reportedly bystanders. The crew fled the place soon after the incident. Bengaluru: A reported cylinder blast during the shooting of the Kannada movie Ranam has resulted in two deaths. Ranam starring Chiranjeevi Sarja and Chetan Ahimsa is directed by V Samudra. Preliminary reports indicate negligence on part of the film crew. 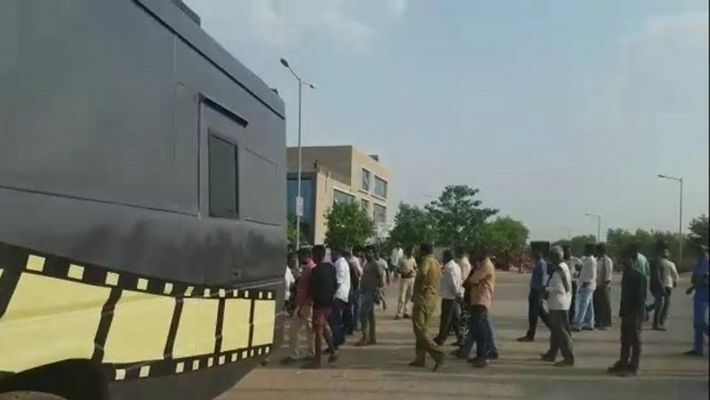 Reports state that the crew had not obtained permission for the shooting at Prestige Tech Park at Bagalur in Bengaluru. Sumera, 28, and her daughter Arya, 8, were found dead after the incident. Another child was severely injured and admitted to hospital in Yelahanka. The incident occurred when stunt master Vijay was choreographing an action sequence. Subash, who was part of the crew was said to be responsible for overseeing the site where the explosion occurred. The film crew fled the scene immediately after the explosion occurred, say reports, and further details are awaited. This has already been reported as one of the major disasters that has claimed lives on film sets after the Masthi Gudi tragedy that struck the Kannada film industry three years ago. Since then, many discussions were held about providing safety to the actors and crew, especially during the shooting of action sequences. The Masthi Gudi crew too had not obtained permission from the departments concerned before shooting in a reservoir that claimed the lives of two actors.